Standard Bank Job Circular 2018 has been found my website http://allexamresultbd.com/ Today Standard Bank has been publish a new a job circular various category. Standard Bank Job title are as follow Head of Human Resources. Standard Bank Limited (SBL) is one of the best commercial Bank in Bangladesh.Recently Standard Bank Limited (SBL) published A new Job Circular 2018 in Standard Bank Limited (SBL). Standard Bank Limited also participated in fund Syndication with other Banks in Bangladesh. Through all these myriad activities Standard Bank Limited (SBL)has created a positive impact in the Market of Bangladesh. Standard Bank is modern Bank having the object of building a sound national economy and to contribute significantly to the Public Exchequer. ■Standard Bank Job Description: Standard Bank Limited is a leading third generation private commercial bank that has a work environment that promotes diversity, embraces change, and provides leadership opportunities to every team member etc. ■Standard Bank Published Date: December 12, 2017. ■Standard Bank Application Deadline: December 28, 2017. ■Standard Bank Job Nature: Full-time. 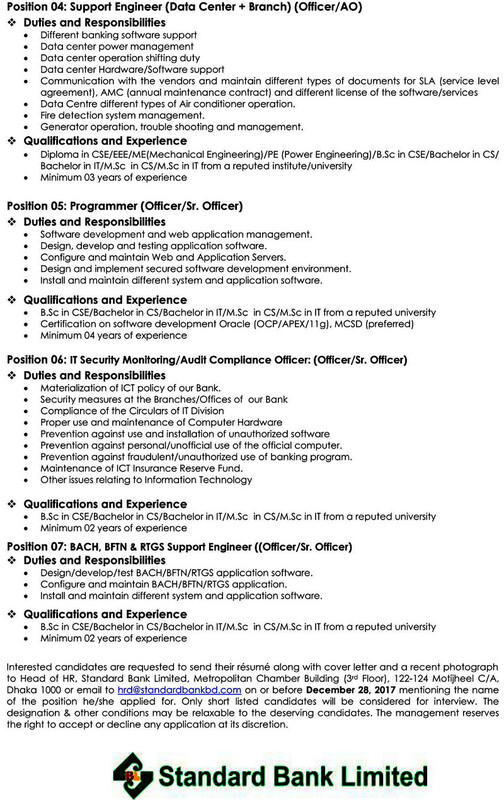 ■Standard Bank Education Qualification: See Job Picture Below. ■Standard Bank Job Experience: See Job Picture Below. ■Standard Bank Compensation and Benefit: As per policy of the Standard Bank . 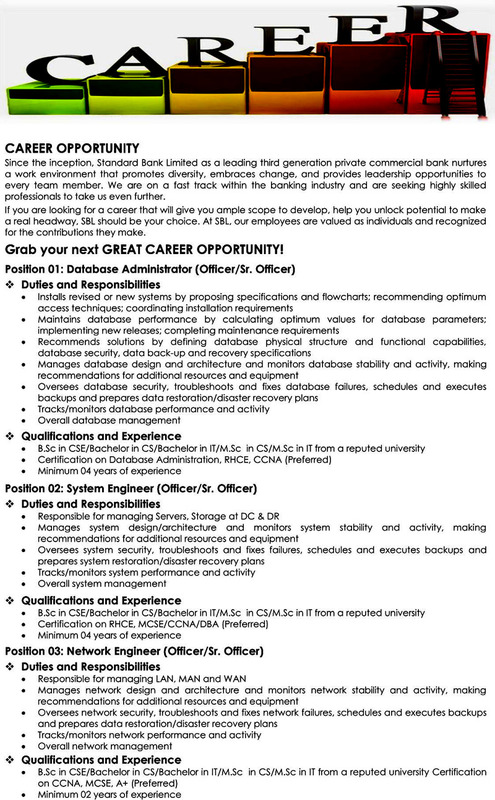 ■ How to Apply Standard Bank Job: Apply with Your full Resume to Head of Human Resources Division, Standard Bank Ltd, Metropolitan Chamber Building, 122-124, Motijheel C/A, Dhaka-1000 or email to hrd@standardbankbd.com on or before 28 December , 2017.